Hundreds of demonstrators paraded through Vermont’s capital city on May Day, calling for health care for all, fair wages and an end to corporate greed. 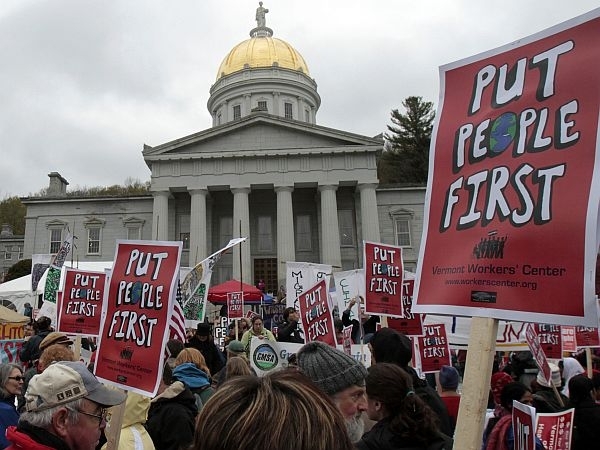 The march and rally in Montpelier was organized by the Vermont Workers Center. Activists today chanted "We are the 99 percent" and urged lawmakers to "put people first." "We were always taught that if you just work really hard everything will work out and you’ll have a fair shot," said Melissa Bourque of St. Johnsbury, a member of the Vermont Workers Center. "We’re realizing that’s just not the way the system is set up, and so I think there’s a lot of people who sit in their living rooms and get really frustrated and don’t really know what to do with that passion," Bourque said. "The Workers Center and all of these other different groups that are here today are giving an outlet for people to come together and stand together and say, we’re not okay with this and we’re actually not just ‘not okay’ with it, we’re going to do something about it," she said. Participants in Tuesday’s events included members of the Occupy movements, the Vermont Federation of Nurses and Health Care Professionals, Rural Vermont and Mobile Home Park Residents for Equality and Justice.